March for life takes place each year in Washington D.C. It gathers US residents who with their presence want to support the right to life of every human being from the moment of conception to natural death. This event is organized around the anniversary of the legalization of the abortion by the US Supreme Court in the Roe v. Wade case in the early 1970s. 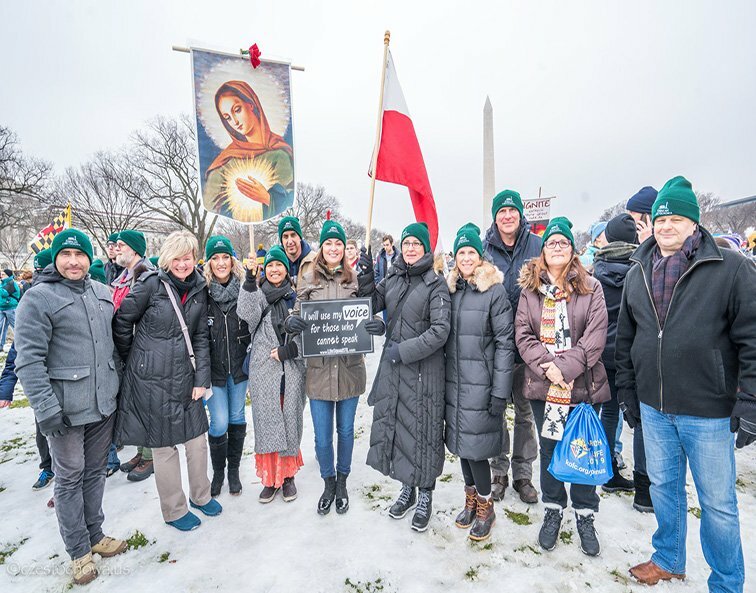 This year’s March for Life took place on Friday January 18 and was organized for the 46th time. Huge crowds, especially young people, organized in various groups, came to this event from almost all parts of the country. It is estimated that more than 300,000 people have attended the March in Washington. Catholics certainly made up the biggest group, especially young people from Catholic schools and universities, but there were also representatives of other Christian Churches and communities as well as different religions. Among so many different groups, a group from our Shrine of Our Lady of Czestochowa has also participated. About 40 people, led by Father Timothy Tarnacki OSPPE, left early in the morning from Doylestown to participate in this event. Before the trip, the participants prayed during the Holy Mass, celebrated in the Chapel of Our Lady of Czestochowa, presided by Father Krzysztof Drybka, OSPPE, Prior of the American Częstochowa. After reaching the capital, our group took part in a rally organized at the National Mall, near the Washington Monument. Hundreds of thousands of life supporters were greeted by Jeanne Mancini, President of the March for Life. After her speech, other guests were invited to speak. Archbishop Joseph Fred Naumann of Kansas City, along with the clergy of other denominations led an opening prayer. A big suprise for all the participants this year was the presence and a speach by the Vice President of the United States, Mike Pence and his wife, Karen Pence. – “46 years ago, the Supreme Court turned away from this fundamental right to life. But at that moment a movement was born – a movement that is defined by compassion and love, that is animated by faith and truth, a movement that is winning hearts and minds up to this day. Because of all of you here and those who were here before us, we know in our hearts that once again life is winning in America!” – said Pence. With his speech, the Vice President at the same time announced the next speaker – President Donald Trump “the most pro-life President in American history”. President Trump gave a speech to those gathered at the National Mall via pre-recorded video. – “When we look into the eyes of a newborn child, we see the beauty and the human soul and the majesty of God’s creation. We know that every life has meaning.” – said the 45th President of the United States. Donald Trump also stressed the efforts which he and his administration make to protect life in the US. – “I am supporting the US Senate effort to make permanent the Hyde Amendment, which prohibits taxpayer funding for abortion in spending bills. Today I have signed a letter to Congress to make clear that if they send any legislation to my desk that weakens the protection of human life I will issue a veto. We have the support to uphold those vetoes. Every child is a sacred gift from God.” – declared Trump. At the rally speeches were also given by: Abby Johnson, Ben Shapiro, Dr. Alveda King, Carl Anderson and members of both Republican and Democratic parties. Republican Senator Steve Daines also announced the creation of the first ever Pro-Life caucus in the US Senate. At the end of the rally, all the gathered supporters of life went to the US Supreme Court building, marching through Constitution Avenue, passing the Capitol building along the way. The march was accompanied by prayer, singing and an atmosphere of joy that the movement in defense of the unborn children is growing so wonderfully. This social and cultural change in America also gives great hope for a legislative change, that a human life from conception to natural death will be protected in a legal manner in the United States.